Sadly, my efforts to persuade Mitchell Beazley, the publishers, to re-print “Wild Colour” have not been successful. 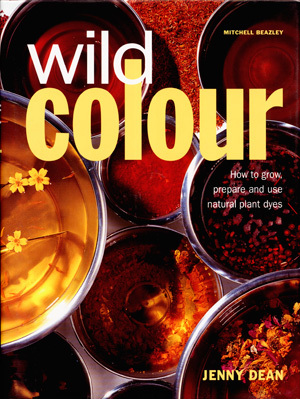 So “Wild Colour” will not be re-printed in the foreseeable future, although the situation may be reviewed in a year or two. I shall certainly try again to persuade them, anyway. It’s so frustrating to know how many people would love to see this book reprinted and yet to be unable to do anything about it myself, because I don’t own the copyright. 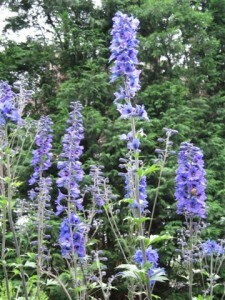 One of the joys at this time of the year is to welcome the return of favourite perennial garden flowers, such as roses and delphiniums. Each bloom is a natural work of art and fills me with wonder. As I sit in the garden and look at the beauty around me, I think about all the other sources of inspiration I have found, particularly in the websites & blogs I have come across about natural dyes, dyeing and textiles in general. I am full of admiration at the range of skills and real creative talent of craftspeople all over the world. The more I become aware of what others achieve, the more I have to ask myself what it is that I actually do. So many people produce beautiful items for sale or exhibitions, while I seem mainly to add to my ever-increasing stock of dyed samples. The other aspect of my activities has been teaching others about the magic of colours from the natural world, either through my books and articles or through workshops. 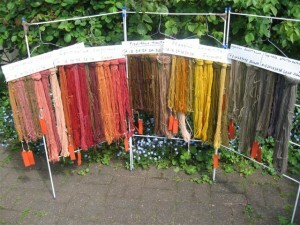 In the past I spent many weekends each year leading workshops or giving lectures on natural dyeing. I ran some workshops from my home and travelled widely to tutor courses elsewhere in the UK, including several summer schools. 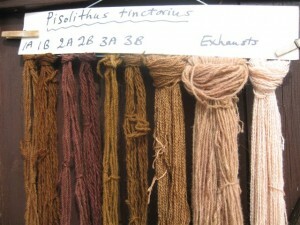 I have also led courses in Spain and worked on a natural dye project in Zambia. Nowadays, my activities are limited by the arthritis that has restricted my physical capabilities, but my passion for sharing my experiences with others has not waned, so this blog has proved a useful outlet for me. So, what do I actually do? 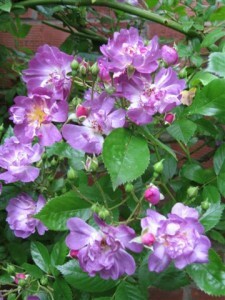 Well, I am still full of curiosity and keen to learn more about natural dyes, so I continue to experiment and write. To reduce my stash of dyed yarns, I knit for myself and for my family and friends. 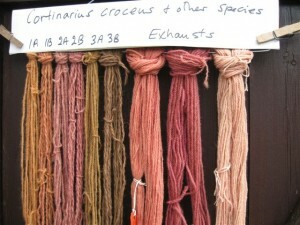 Occasionally I dye yarns for other craftspeople or for museums or research purposes. 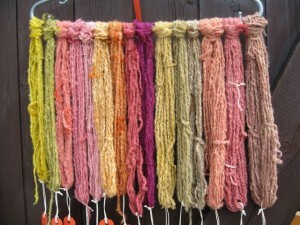 I also love to work with wool, starting with the raw fleece and spinning it on my spinning wheel. I’m not a particularly good spinner, and I’m not the sort of spinner who wants to spin very fine yarns that look just like commercially-spun ones, but I produce yarns that please me and suit my purposes. So I suppose I am creative in my own way, but I could never match the talents of the creative artists whose blogs and websites are such an inspiration and source of pleasure to me. 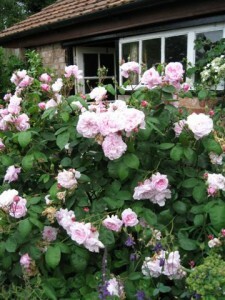 And I do spend many hours in my garden, pottering or just looking at the natural beauty around me. 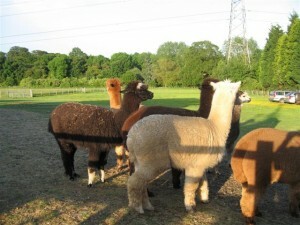 Recently I went with members of the Bedfordshire Guild of Weavers, Spinners and Dyers to spend a pleasant evening admiring alpacas. 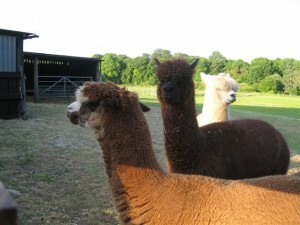 These particular alpacas belong to David Titmuss, the son of one of our members, Toni Titmuss, and David and his wife had kindly invited us to visit their farm for one of our meetings. The early evening sunshine bathed everything in a warm glow and the alpacas were happy to be photographed, although they quickly lost interest if required to pose for too long. The natural colours of the alpacas vary from white, cream and beige through various shades of rust and brown to almost black, and all these colours are lovely. The fleece can be extremely soft and a pleasure to handspin. Of course, as a dyer, I was interested in testing some dyes on white alpaca fleece, so I got my dyepots ready for a few experiments on some of my skeins of handspun alpaca. In general, I was pleased with the depth of colour I achieved. However, as alpaca tends to be more “hairy” than sheep’s fleece, and less “woolly”, the colours are probably less saturated than those achieved on sheep’s wool. One other thing I learned about working with alpaca is the importance of washing the fleece very well before spinning and dyeing it. When spinning sheep’s fleece, I often soak the sorted fleece overnight to get rid of any dirt, then spin “in the grease” and wash well afterwards and before mordanting or dyeing. This method proved less successful with alpaca. I found the grease was difficult to wash out after spinning and this caused patchy results from some of the dyebaths. I got much better results with alpaca fleece that had been well washed before spinning. After spinning, I washed the skeins again and then mordanted and dyed them. Here are further details of the fungi I used recently and the colours I achieved from each. 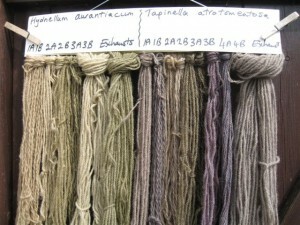 The extra, usually larger, skeins are from the exhaust dyebaths and are alum-mordanted. 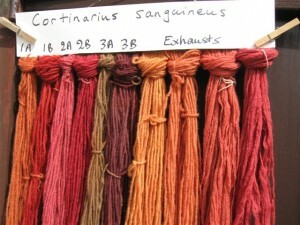 These colours come from a dyebath of a mixture of Cortinarius croceus and other orange- and yellow-gilled species of Cortinarius. This shows, on the left, colours from Hydnellum aurantiacum and on the right, colours from Tapinella atrotomentosa. 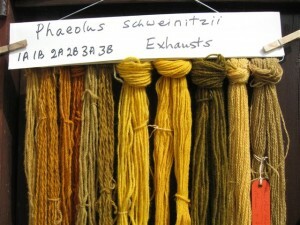 These colours are from Phaeolus schweinitzii. The green shades from the exhaust dyebath were modified using iron. Recently I managed to acquire a selection of fungi, mainly purchased through Leena in Finland, who either had some for sale herself or gave me the details of a supplier. Since then I have been once again exploring the wonderful world of colours from mushrooms. The photo below shows the range of shades I’ve achieved so far. I tested each fungus using alum-mordanted and unmordanted wool and used washing soda (alkaline) and iron modifiers. I limited my tests to these two modifiers only, partly in order to reduce the number of samples and partly because, in my experience, these are the most useful modifiers. Also, as copper is toxic I try to avoid it where possible. In my next post I’ll give details of the various fungi I used and the colours I obtained from each.